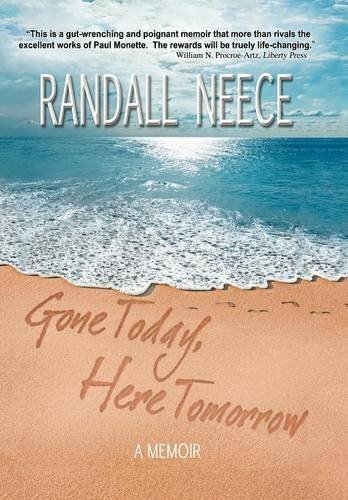 Randall Neece had it all a successful career in television, a perfect marriage to his husband, Joe, and a future that was all mapped out. That map was suddenly run through a shredder when Randy was diagnosed with Aids at a time when there was no hope of survival. Yet, something remarkable happened. Guided by Joe's love and commitment, and by tackling obstacles and facing his own fears, Randy realized that he had found a place he'd forgotten existed. He found a placed called tomorrow. Written with humor and unflinching honesty, Randy's story unveils the triumph of the human spirit and reflects the true meaning of love, companionship, and marriage. Gone Today, Here Tomorrow is an inspirational love story for our times. Randall Neece has created, produced and directed a diverse range of programs and documentaries for broadcast television and education. His work as a producer and director has been honored with more than twenty national and international awards including an Emmy Award for the AIDS drama Secrets, winner for Outstanding Achievement: Children's or Youth Special. Neece has cocreated several game shows, and also produced and directed shows for CBS, NBC, Lifetime Television, The Family Channel, and for Syndication. He lives near Malibu, California with his husband, Joe Timko. Together, they own and operate Canyon View Ranch for Dogs.